A couple weeks ago, my daughter-in-law informed me that Prague made the news in Canada. I was excited to hear about it until I saw the title of the article, "Prague's TV tower babies pulled from 'ugliest building in the world' for repairs". She asked if I knew what the article was talking about. The answer to that question is, of course, yes. When the tower reaches almost to the clouds over Prague's skyline, everyone in the city know about the tower. I think it's hilarious that the CBC declared this the "ugliest building in the world". I didn't even consider it to be a building, but it sure is ugly. Zizkov Tower was built during the Communist Era in the 1980s. 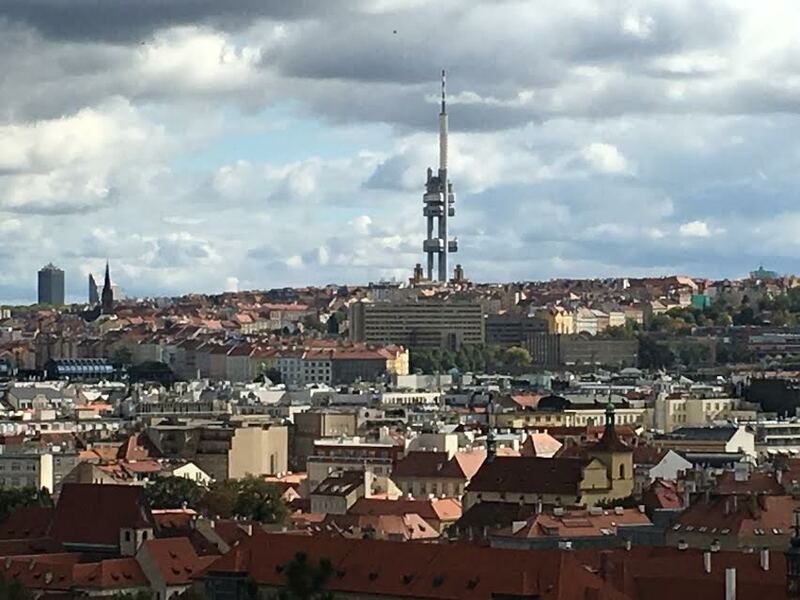 The purpose of the tower was to spy on people in Prague and to block radio signals. The site was picked since it was the highest point in the city. It didn't matter to the powers in control that this site was located in the middle of a Jewish cemetery, which was destroyed during the construction of the tower. No wonder people of the city hated the tower. After freedom came to the Czechs, artist David Cerny proposed to add babies that would crawl up and down the tower. Don't ask me why. I'm not sure if the babies make the tower more ugly or cuter. Maybe he thought that the softer side of babies would improve the attitude toward the ugly tower. The artist must have made extra babies that didn't fit on the tower in the 1990s. There are three babies located in a park on Kampa Island along the river in Prague. We went to check them out. The dimensions of the babies are a bit out of whack. The head appearing oversized for the body. 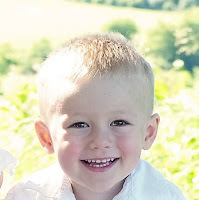 And then there's the face, or lack of a face, which you can see on the baby in back of the one I'm leaning on. In place of facial features, there's just a black rectangle on the flat surface. The article from the CBC informs the readers that the babies are being taken off the tower this fall for repairs. On the picture above, most of the babies were already removed leaving the three to continue their crawl. After the repairs, the babies will be reattached to the tower next spring. Update: as of today, all the babies have been removed. I wonder if the opinion of the Czechs will be that an empty tower is better or worse than one crawling with babies. I'll let you know if I hear the answer to that question. What is the tower used for now? TV reception? Why not tear it down? Actually, we went to see it yesterday and found out that it has a restaurant and hotel in one level and observation deck on the top level. There are all sorts of digital too-dads on the top of it. I'm sure it boost networks, wifi, that type of thing. It's also for TV reception, so I guess it can't be torn down.